The continued dismal performance of the UK economy is entirely consistent with the predictions of those of us who have argued consistently for the last two years that premature fiscal consolidation would be severely contractionary in the short term, and risked doing significant long-term economic and social damage. As has been widely reported, this analysis is now generally shared by most serious economists, including most notably the Chief Economist of the IMF, Olivier Blanchard, probably the most distinguished empirical macroeconomist working on policy issues at present. It is obviously impossible to argue that an economy that has grown less than 1 percent in the period since the fiscal consolidation was introduced, compared to the approximately 6 percent that the government forecast at the time, is performing acceptably. So some commentators who supported the government's programme - or indeed, argued that it did not go far enough - are taking a different approach, arguing that economic weakness cannot be attributed to austerity because, in fact, there is no austerity. Last night I got into a Twitter "debate" with Michael Fabricant, who is Vice Chairman of the Conservative Party. I replay it here to set out the facts (which are fairly simple) and perhaps to give Mr Fabricant one more change to correct his position gracefully. "Lesson learned. NEVER take a 'fact' from a colleague at face value. I withdraw the remark on Debt to GDP ratio. Apologies to all." "GDP to debt ratio almost as big now as WW2. 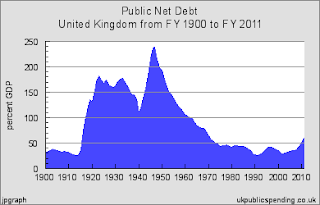 Total war achieved the same debt ratio as total incompetence achieved in 2000's by Gordon." "I hope @Mike_Fabricant will retract that last tweet; simply wrong, as chart shows." At the Treasury Committee in October, I came under sustained questioning as to my view that low long-term interest rates in the UK reflect economic weakness (domestic and global) and expectations that short-term interest rates set by the Bank of England will remain very low (again, reflecting economic weakness); and not, in any meaningful sense, the "credibility" of government fiscal policy or economic strategy more generally. A much more detailed discussion is here. I haven't always been complimentary about the European Commission - either its economic analysis or its policy advice. So it's nice to be able to be wholeheartedly positive about the excellent report "Employment and Social Developments in Europe 2012" (brought to my attention by this article by Ambrose Evans-Pritchard in the Telegraph, also excellent) produced by the Commission's Directorate-General for Employment, Social Affairs and Inclusion. Yesterday the Government published the "Midterm Review: Programme for Government Update." This was intended to be a comprehensive assessment of progress against the commitments made in the original Coalition Agreement. The Prime Minister said that this "audit" would be "full, frank and unvarnished." Naturally, I was particularly interested in how the Review described progress in deficit reduction, particular, given my view (set out here) that the Government has effectively abandoned its initial "Plan A" for deficit reduction. [This article, an expansion of my earlier blog, was written for the Child Poverty Action Group (CPAG) report "The Double Lockout". Obviously I do not necessarily share or endorse the views expressed by CPAG or by other authors whose chapters are included in the report (or they mine)]. First, macroeconomic; is this sensible and/or necessary given the short-run prospects for the public finances? Second, long-term sustainability; is this sensible and/or necessary given long-run trends on benefit expenditure and rates?